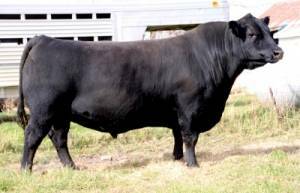 No other bull in the current sire list can match Mr Aberdeen’s unique combination of calving-ease traits including CED and BW with performance, scrotal, and muscle. He sits alone in the sire sort achieving the difficult antagonistic combination of superior calving ease and muscle. These are the statistics that sell to commercial producers that demand convenience traits and cattle that sell themselves with eye appeal and thickness. Whether he is coming or going, you will like the impression Mr Aberdeen will leave you with. This bull is really strong with tremendous shape and eye appeal...he can be a breed changer. It is rare to find a calving-ease bull with this much rib cage and muscle in a low 6 frame package to move a herd in the right direction. He is a realistic choice to move your cattle genetically to withstand harsh environments and be rewarded when it pays at sale time plus great keeper females, too. Mr Aberdeen is one of the densest, deepest ribbed, high capacity bulls with great scrotal genetics and excellent genomic data to surface in years. This is a big-time bull with the data that sells to big producers with big herds in big country cattle operations. This moderate frame outlier will move your herd in the right direction.